Invoice & collect with a click. No more paper time slips, stamps, or mailing invoices. Integrated credit card and ACH bank transactions reduce your entire billing day to a single click. No more awkward collection calls, manually typing in credit card info, or swiping cards in a separate terminal. Agencies who use e-payments collect funds in 2 days versus 15 days. When all of your clients are using e-payments, bad debt moves from 5% to 2%. The avoidance of bad debt pays can more than cover the cost of the credit card processing fee. Most merchant partners claim a low rate that balloons based on the type of card and number of transactions - this makes estimating your cost frustrating. We have flat, transparent pricing. Process as many transactions as you want for the same low rate. Payments are automatically allocated to the correct invoices, saving you the time of manual reconciliation. Stop chasing down overdue payments and facing the risks of bad debt by automating the process and using integrated payment processing. Grant payers access to the easy-to-use Family Room Portal, where they can review invoices, enter payment information, and even split payments online. Clients receive email notifications when invoices are sent. They simply click the email to see all the details. Set clients up to pay automatically. An email goes out a few days in advance of the bill, just like a cell phone or credit card bill. We use tokenization and the highest level PCI compliance to ensure your clients' information is safe and secure. Give payers the power to split payments, down to each cent. They choose how much of the payment is allocated to each invoice, so you don’t have to. How much are the payment processing services? Rates vary based on the volume of processing but typically credit card rates range between 2.75% and 3.25%. The ACH program has a nominal $15 per month charge plus $0.75 per transaction. 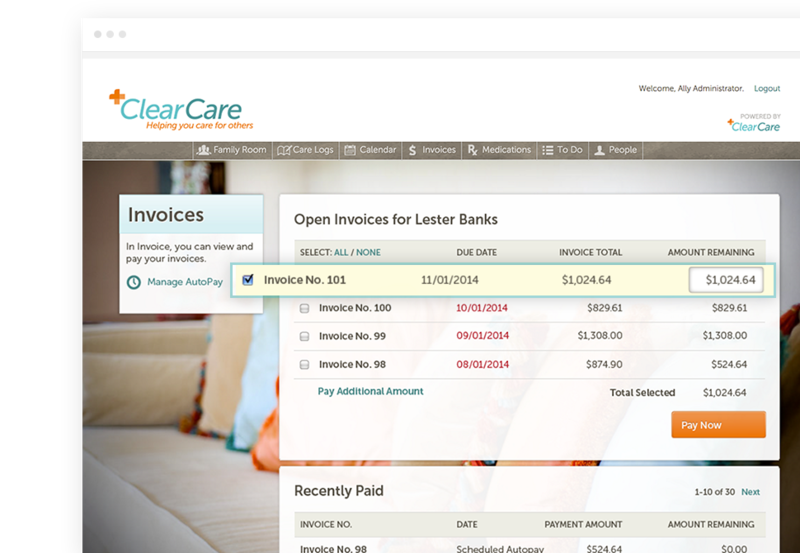 There is no additional fee from ClearCare for the integration, AutoPay, or Family Room access. Are ACH / bank payments accepted? Are e-payments accepted in Canada? Yes! Clients can set up automatic payment processing using a credit card or ACH account. At this time, e-payments (either credit card or ACH) are not available in Canada. How does the electronic bill pay service work? When all of your clients are signed up with payment processing services, you just press the 'Invoice & Collect' button - it's really that easy. Invoices are sent to your clients electronically via email. Clients who have set up AutoPay will automatically make a payment on the date that you choose. Payments auto-reconcile with the correct invoice. Collect funds from your clients on a schedule that you choose. This is the most popular option - no more invoicing, manually typing in credit card numbers, or waiting for funds to arrive in the mail. Can I accept credit cards over the phone? Yes! Clients can enter their payment information in the Family Room or you can accept payment over the phone.